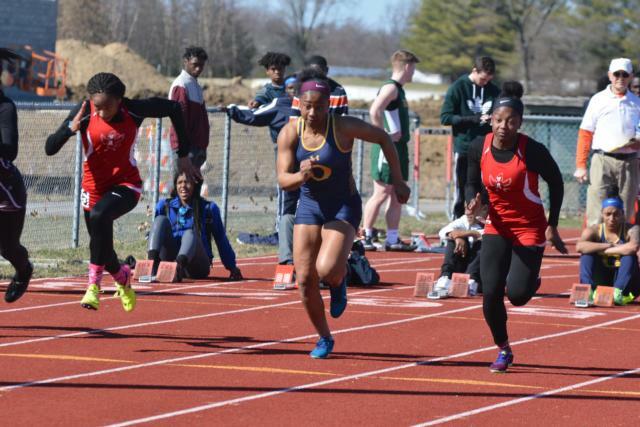 EDWARDSVILLE – Alton senior track sprinter Jeanea Epps enjoyed some good performances in her races during an informal triangular meet with O’Fallon and Southwestern Illinois Relays at the Winston Brown Track and Field Center, and she feels ready to go for the new season. As a captain, it’s up to Epps to set the table for the other members of the team, and it’s a job she takes seriously. “I want to make sure that once I leave, everyone is prepared, and they feel like that they can become leaders for the next groups to come,” Epps said. Epps is a short sprinter, running both the 100 and 200-meter dashes, along with being a key component of the Redbirds’ 4x100-meter and 4x200-meter relay teams. Epps feels very optimistic about enjoying success for herself and her teammates in the 2019 season. And doing well at the state meet this May at Eastern Illinois University’s O’Brien Stadium is very important to Epps, who has some great ambitions for the team.